Kvenel the Tongue is an ancient Nord hero who died long ago and was buried in Volunruud. He now lives in his burial chamber as a ghost. For historical information, see the lore article. Kvenel dual-wields two unique items: Eduj, a sword, and Okin, an axe; both are enchanted with frost damage. He also has two backup weapons, which are leveled but not necessarily of maximum quality. The rest of his equipment is a variant of ancient Nord steel, which cannot be looted and is considerably stronger than the obtainable kind. As a ghost, he has an additional 100% frost resistance on top of his Nord ability, and is also completely immune to poison. He is, however, vulnerable to paralysis. His health is astronomical for his level, considering that a level 30 PC would have a maximum of 390. He also has an impressively high stamina, allowing for nearly unlimited use of power attacks. Kvenel is immune to all anti-undead spells, despite being below their level limit. 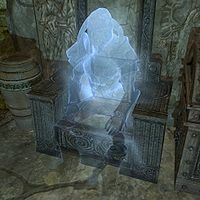 Messages for him resisting shouts and other similar reactions use a generic title such as "Draugr Deathlord", depending on the leveled base enemy type, rather than his name. He cannot be detected by any Detect Life or Detect Dead spells, but can be detected by Totem of The Hunt and the Aura Whisper shout. The remains of Kvenel may have to be looted twice to obtain both Eduj and Okin. This page was last modified on 25 March 2018, at 14:02.